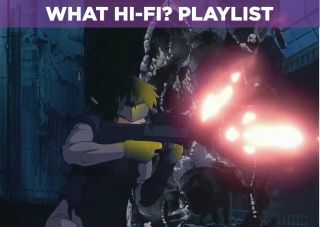 Ghost in the Shell - Blu-ray review | What Hi-Fi? After Akira brought the medium of anime to the world's attention in 1988, many other mangas followed suit with feature film animations, and one of the better efforts was Mamoru Oshii's Ghost in the Shell. An anime that's inspired several films and video games since its debut (including The Matrix), it's finally getting a Blu-ray release in the UK with the film's 20th anniversary on the horizon (although confusingly, the reason for this release is the manga's 25th anniversary). Set in Tokyo, 2029, the plot follows Major Motoko Kusanagi's (Mimi Woods) government police officer who's assigned to track down an elusive hacker called the Puppet Master. In truth, that's all there really is to glean from the plot that's more fixated on existential issues than action set-pieces. Ghost in the Shell doesn't have much in the way of narrative, but it constantly tugs at you with its musings on humanity and technology, balancing philosophical quandaries on the nature of humanity with a few dynamic action scenes. Unlike other animes that came out at a similar time (Patlabor, to pick one), Ghost in the Shell is successful in making its themes engaging without alienating or boring the audience, and considering how many animes drone on in a stilted manner, that's quite an achievement. Ghost in the Shell is grown-up animation done well, the main narrative conflict summed up in Major Motoko who's part cyborg, part human and constantly questioning her own agency and worth. While the ending is a bit vague and uncertain, it's certainly one that gets you thinking. And it's well paced too: its detective story stylings in the manner of Blade Runner, mixed with some lashings of cyberpunk, and at 80 minutes long, it's in no mood to waste time. The high-brow philosophy and rather cool mood to proceedings may not suit everyone, but if you've not seen Ghost in the Shell, this release is as good a time as any to (re)discover it. With the film coming out before the age of CG animation, you can't get away from the 1990s aesthetic. But for a film that's almost 20 years old, this transfer is about as good as it'll ever be. Many of the problems visually will be down to the film's production. We encountered a few instances with white flashes in the background, and there's a soft glow that seems to be part of the film's look. But, this is a clear upgrade from the DVD and an improvement over the CG-riddled Ghost in the Shell 2.0. Visually characters are clearly defined, there's little motion blur and for the most part colours hold. Ghost in the Shell bounds on to HD with a 5.1 DTS-HD Master track and a 2.0 LPCM Japanese track. Dialogue is clear and comprehensible, while explosions and gunshots (which feature a lot towards the end) are loud and punchy. From what we listened to of the Japanese track, it's less dynamic than the 5.1 mix and a bit condensed, but, for the time being, this is the best we'll have for anyone wanting to hear the film in its native tongue. Ghost in the Shell is seen as an iconic film and for good reason. Although this release is severely lacking in the extras department, from an AV point of view, this edition is the best this film has looked or sounded.